Swap, swap, swap. Swappy, swap, swap. I was trying to think of something new to talk about today, and it occurred to me that I have never written about Ravelry swaps! Shocking! I don’t do them as much as I used to, but every year I try to get in at least one or two. When I was in college and grad school, I almost always had a swap or two going, just so that I had something fun to work on in-between all the lab work and exams. So what is a swap? You remember having a pen-pal as a kid? It’s kind of like that, but instead of sending a crummy letter that your third-grade teacher made you write, you send a whole box of amazing crafts! There are swaps built around themes (favorite books, TV shows, movies), favorite crafts (spinning, knitting, weaving), locations (German swaps, English swaps, American swaps), and there are swaps for every budget. Sign up through a Ravelry group, and commit yourself to sending your swap package by a certain day. Then, post a general likes/dislikes listfor your swapper to use to tailor their package to you. Check in once a week to let everyone know you haven’t run away or died. And, after you’ve done your planning and stalking (and crafting and shopping), you send your package off to your partner, and someone sends a package to you! Super fun! Everyone loves getting packages, after all! Here are three groups I’ve swapped with in the past, but definitely look around on Ravelry for more swaps- there are dozens! Swap on a Budget: This is a general-interest swap for people who don’t want to break the bank. Fill a shoebox with less than $20 worth of goodies (including a skein of yummy yarn!) and send it on its way! The Odd Duck Swaps of Ravelry: This is a group of special one-time themed swaps. Each month they’ll change their theme (usually based on TV shows or movies). Reducio Sock: Mini Sock Swap: This might be my favorite swap group! But, that’s because its theme is so perfectly aligned with my interests. Miniature Harry Potter packages! If you’re an HP nerd (or a miniatures nerd), like me, then definitely check this one out! Have you ever participated in a swap on Ravelry? How did it go? 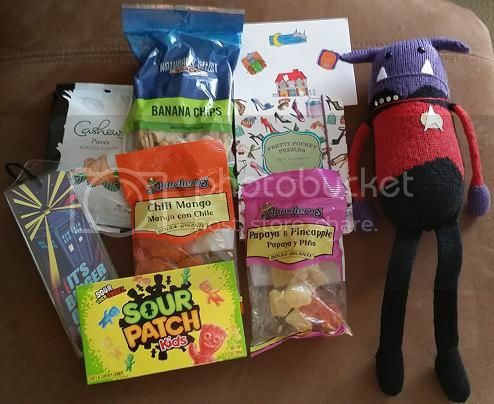 This entry was posted in FYI and tagged odd ducks, package, pen pal, penpal, ravelry, reducio, send, swap, swap on a budget on November 4, 2015 by onemilljellybeans. Ooh, I LOVE swaps! I’ve done loads of reddit gift exchanges but only one ravelry swap; a Golden Skeins yarn and bag swap. It was awesome, I am totally converted. I LOVE swaps! Absolutely adore them! I started out my swap love with Fingerless Mittens/Gloves. I sent/received several of those. I actually had my partner send me socks instead of fingerless mittens for one of them, because I loved her socks (and she didn’t mind). I recently completed one in the Dangercraft group (http://www.ravelry.com/groups/danger-crafts), where we made a Halloween-themed Monster and sent it off with lots of goodies. Isn’t he awesome with a side of awesomesauce? I love him! Oh my gosh! He’s the cutest! So cool! Pingback: Finding a Forever Home: The Swap | Knitting the Stash!